These non-woven bags containing DRIERITE are used to completely dry the air within a package or container during shipment or storage. The disposable packets are dust tight and will protect enclosures for many months when used within an adequate moisture barrier. These desiccant bags are approved by the FDA and DRIERITE is Generally Recognized As Safe (GRAS). Every box of DRIERITE Desiccant Bags comes with a 30% Relative Humidity card that changes from blue to pink when the bags are no longer active. 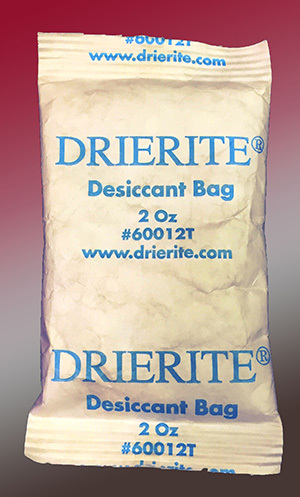 DRIERITE desiccant bags are filled with DRIERITE (anhydrous calcium sulfate). Available in white TYVEK® or brown kraft paper. Held together by heat seals. A DRIERITE desiccant bag will reduce the humidity in a sealed enclosure to a -100° F dew point in about 10 hours or less. Materials packaged with these desiccant bags are protected from corrosion and other harmful effects of moisture contamination. DRIERITE bags leave behind less residual moisture than most other types of desiccant bags. DRIERITE also performs well at elevated temperatures and will not release absorbed moisture at less than 350° F. This is an important consideration when shipping products during variable weather conditions. Bag Size Cu. ft. Cu. in. For containers or bags larger than those listed, use multiple DRIERITE bags. This table takes into account water in the airspace inside the package only. If the contents contain additional water, more desiccant is required. See page How much Drierite?